Want a little more spice in your life? 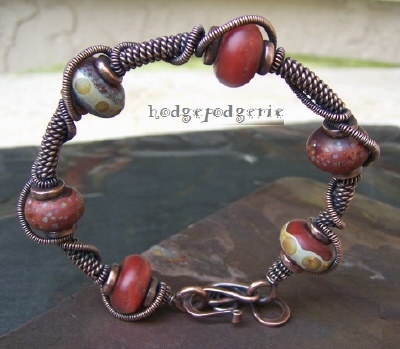 Then check out this hot lampwork and copper bangle. 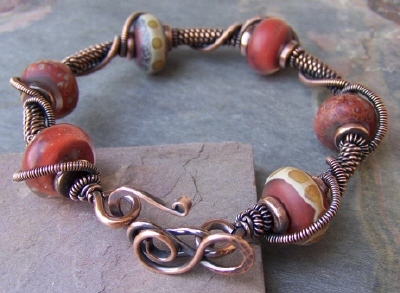 I've combined pure copper wire and beads with fabulous lampwork beads in spicy autumn colors by the talented team of Two Sisters Designs. These rich hued beads have been softly etched, giving them a gently aged feel. 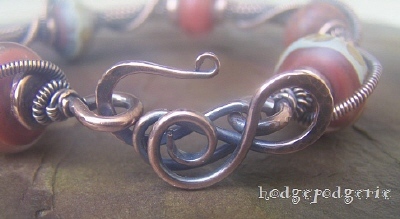 A long coil wraps around the entire length of the bracelet. I've added a patina to enhance it's richly textured design. Besides its natural beauty, copper is said to have therapeutic properties. Many arthritis and joint pain sufferers swear that wearing copper, such as in a bracelet, helps provide relief from rheumatism, arthritis and stress. I've finished the bangle with my own unique handmade hammered wiredoodle clasp, further enhancing its handcrafted look. Return from "Autumn Spice Bangle" page to "Bangle Gallery" page.